IBM held its 20th annual IBM Connect conference (previously known as Lotusphere) as part of its IBM Social Business efforts at the end of January. 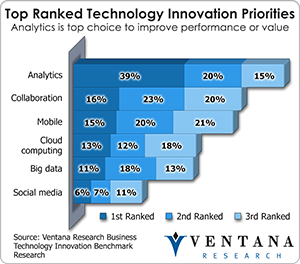 The conference focuses on business and social collaboration technology, which our business technology innovation research found to be the second-ranked priority for business innovation. At the conference IBM made a series of significant announcements, including a new version of its social collaboration suite, IBM Connections, and the ability to use the software on a cloud computing platform. The proper use of technology enables businesses to be more efficient. Our recent research into technology for business innovation found that 56 percent indicate innovative technology is very important, yet only 9 percent are very satisfied with theirs, showing plenty of room for improvement. As we enter 2013, businesses have more choices than ever for technology to improve business and IT. Our firm has identified six key technologies that give organizations significant competitive advantages: big data, business analytics, business and social collaboration, cloud computing, mobile technology and social media. 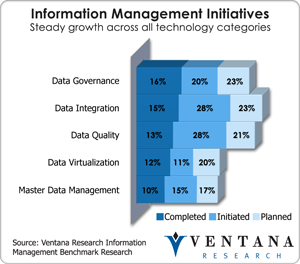 Our research agenda for 2013 is designed to help organizations assess and analyze these technologies and make the best possible decisions. Managing the access, storage and use of data effectively can provide businesses a competitive advantage. 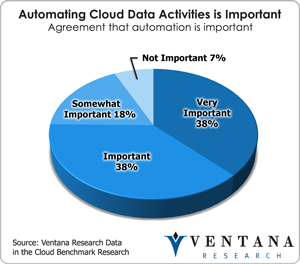 Last year I outlined what the big deal is in big data, as the initial focus on the volume, velocity and variety of data – what my colleague Tony Cosentino calls the three V’s – is only one small piece of how organizations should evaluate this technology. The more balanced approach is to include what he calls the three W’s – the what, so what and now what, which shifts the focus to an outcome-based view that can handle the time–to-value urgency found in business. Big data analytics can help assess the volume of data, while the velocity of data that is potentially in-motion is best handled by what we call operational intelligence. Beyond these, techniques and technology such as predictive analytics and visual discovery facilitate extracting more value from big data. Along with a wide variety of data, these tools help organizations focus on optimizing information assets. We will soon conduct benchmark research into information optimization to determine how organizations are dealing with their information today and what steps they are taking to improve. In-memory computing will surely be one of those steps, as it can significantly improve the time-to-insight equation. 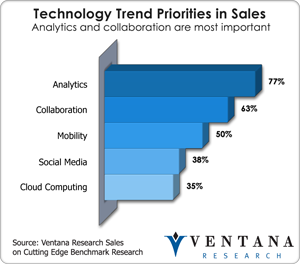 Most organizations see improving the effectiveness of sales as a way to increase productivity. Those organizations that take advantage of the latest sales applications and technology are finding themselves with a competitive advantage, but many organizations lack the time and resources to assess and deploy appropriate platforms. That’s a shame, since most sales organizations have plenty to improve in their selling, forecasting, incentives and planning according to our latest research on sales performance management. We found a high demand even for many of the basics; for instance, many organizations still use personal spreadsheets or outdated applications that are costly to manage. At the same time, marketing organizations are investing heavily to be more revenue- and sales-focused to ensure they maintain relevance and contribute to their organizations’ performance and profitability. Both sales and marketing have fixated on specific processes and how they can work better together. Happy New Year to all my readers and followers. I hope everyone has gotten some rest and is ready for a great 2013. 2012 was a busy year in which we saw a critical inflection point, where an elevated focus on new methods and innovative technological approaches such as big data, business analytics, business and social collaboration, cloud computing, mobile technology and social media become part of the mainstream business and IT dialogue. These technologies are beginning to be part of or embedded into enterprise software that will be available in 2013. This is a critical step forward that will help organizations become more efficient in their operations and use technology to its fullest. As we start the new year, I thought a reflection back on the some of the highlights from 2012 was in order.